It doesn’t get much better than that. Let’s move on to the concept. 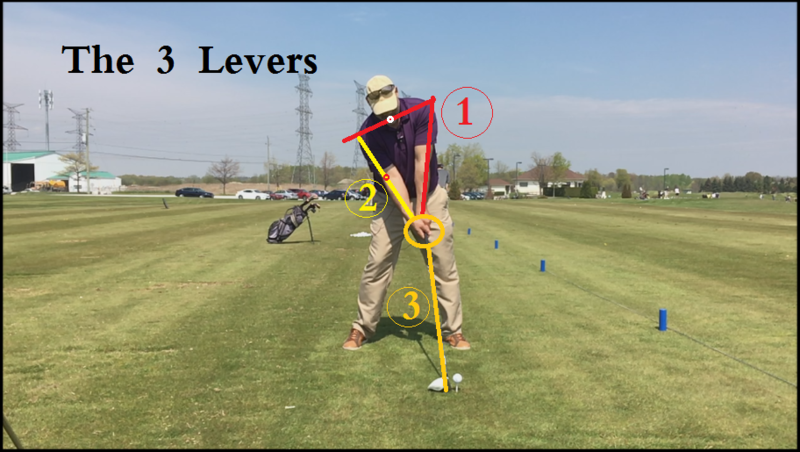 So, true power & leverage come from the action of the hips & legs with the weight transfer on the pivots, and when you try to swing “harder,” the danger is that you’ll now engage the arms & hands and/or turn early trying to speed up the club head, and nothing good happens when you do this. In the latest MCS video series beginning with “E = MCS” and ending with the last, “MCS – The Kinetic Chain,” you’ve heard me talk about the “Pressure Plate” concept of the weight transfer on the pivots. This concept is designed to get you a more aggressive move into the leading hip, which I’ve demonstrated in the videos is exactly how you create the effortless leverage with the Primary Lever system. The more aggressive, the more leverage, the more leverage, the more power and acceleration and thus more impact speed – all without doing anything extra with the arms and hands – It certainly works for me! Another great point in the non-excerpt video was touching the right knee with right hand to get into proper address position. MCS is amazing from the viewpoint of the geometry of body dynamics of how the pieces are synchronized to fit together. I think Fluff will soon be slaying his friends if his short game is in order. Well well well – look who shows up the same week I was thinking, “Gee, I haven’t seen or heard from Chief in some time!” Good to see you buddy. And yes, that’s the thing I always ask someone to do when they think they are properly biased and I can see they’re not. After a while, they can hit the position and when I ask them to do it, they’re there! Hey DJ, I’ve used the hand to knee for some time. It works so good. But one thing I’m working on is being very specific. Like my hips move just slightly to the left but stay pretty straight with the target line. And I feel like I’m touching the right edge of my knee cap not the side or back. Thanks, JS – my only comment on your thoughts is that the hips really should open slightly as you move them left, just as they will open naturally on the down swing when they move to the target. Other than that, I have no argument with what you’re doing – carry on! Good stuff with the left heel pushing down to start the transition. I’ve noticed this increases my swing speed 5 – 10 mph. 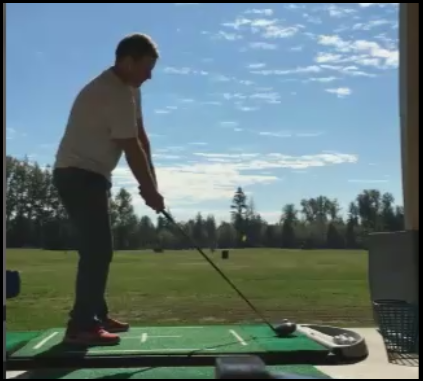 I’ve been practicing since buying your video and I’m really having to work at getting into your address position with lower right shoulder and right knee kicked in. My old address position was with pretty level shoulders. 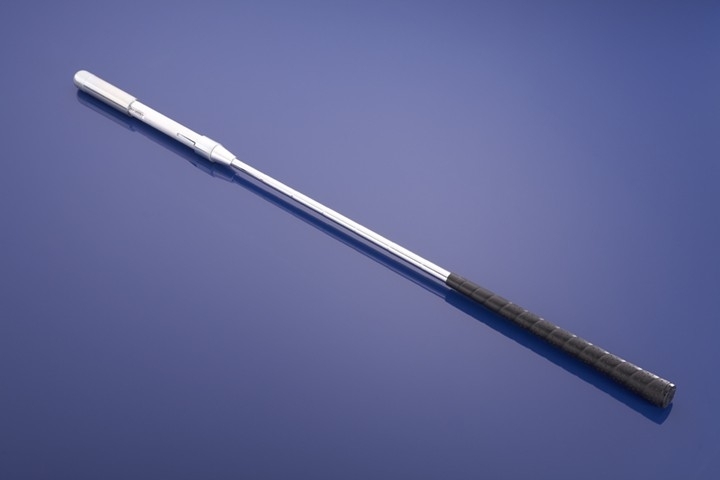 Also getting the straight line from left shoulder down thru left arm and shaft to clubhead with driver at address has been a weird feeling for me, but gives me high swing speed (115 – 120 mph) I will be practicing the MCS a lot this winter. … I will be practicing the MCS a lot this winter. DJ – as you swing down and thru the ball, are you rotating the upper body with passive arms and wrists? What are you “thinking and doing” as the motor of your swing after you stomp down on the left heel? After years of turning through impact and having a steep down swing plane, Tom – anything to do with “rotation” is the last thing on my mind. The transfer to the leading foot triggers the hips, and any rotation should come from the natural kinetic chain. The shoulders are square at address, and should be square at impact, with the weight shift and hips providing the necessary action. So, no thought of rotation. Especially with the upper body. I hope that helps! Thanks for the fast answers DJ. One last question – at impact is your left bicep still on your left pec or has it come off as the club is releasing? Releasing – you remember ever seeing pros swinging with a towel or something tucked between leading arm and chest? A good way to see if you’re separating. When I do that, there is no chance that towel or even a slip of paper drops until I’m well into the follow-through. Awesome – thanks. The keys to the kingdom are slowly unlocking for me. Its amazing how I was able to shoot low 80s with my old homemade swing. There is no aspect of it that fits with what you or a couple other methods teach! No wonder people have a hard time getting better at golf. Very welcome, Tom! And you’re correct – it is very hard to get better in the age of the Modern Golf Swing, with all of the incorrect and flat out dangerous swing methods floating around out there.